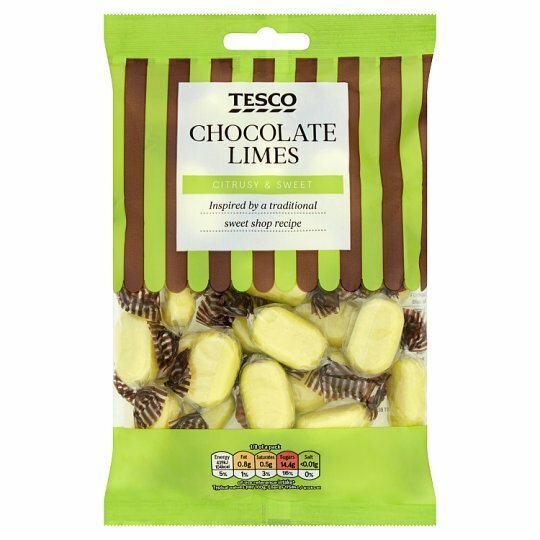 Lime flavoured sweets with a dark chocolate centre. INGREDIENTS: Glucose Syrup, Sugar, Dark Chocolate (10%) [Sugar, Cocoa Mass, Cocoa Butter, Fat Reduced Cocoa Powder, Emulsifier (Soya Lecithins)], Sorbitol Syrup, Citric Acid, Flavouring, Spirulina Concentrate, Colours (Curcumin), Water. May contain milk. For allergens, see ingredients in bold.